The Perch Pond was constructed, alongside the other ornamental lakes around the southern and eastern sides of Wanstead Park, between the 1720s and 1740s. It was first depicted on Rocque’s 1735 Map, which seems to suggest that it was originally intended to be slightly larger and perhaps somewhat deeper than was actually the case. A large excavated depression at the western end of the north bank appears to reflect the configuration shown on this plan, but is well above the actual level of the water in the later pond. No islands are shown. The Perch Pond in its completed form is first depicted on Rocque’s 1745 map, which had been surveyed the previous year. The depiction of the serpentine lakes in this map is rather schematic and they are not located accurately in the landscape. However, subject to this proviso, Rocque shows the Perch Pond much as it is today: an elongated, broadly rectangular, water body, with a group of islands at its western end. It is separated from the Heronry Pond to the west, and the Square Pond to the east, by dams. The islands in the Perch Pond give rise to interesting questions. It seems likely they were constructed after 1735, but before 1744-5 when the pond seems to have reached something like its final form. Rocque depicts four rectangular- shaped islands. These are also depicted on the 1779 Searles map, though given Searles’ schematic treatment of islands in the Ornamental Water, what he shows should perhaps not be relied upon in detail. Slightly different depictions of the layouts of the islands are shown on different maps. However, by the early nineteenth century, they are consistently shown in a form recognisably similar to what now exists – four small islands enclosed by four thin, curving or "L"-shaped islands. There has been some debate concerning the origin and function of these islands. Catton's c.1750 image of Wanstead from the east shows the islands as being wooded from an early date. John Phibbs of the Debois Partnership suggested that their layout is reminiscent of a water-garden in the Tudor style, and suggests that they are perhaps survivors of some pre-existing water body. 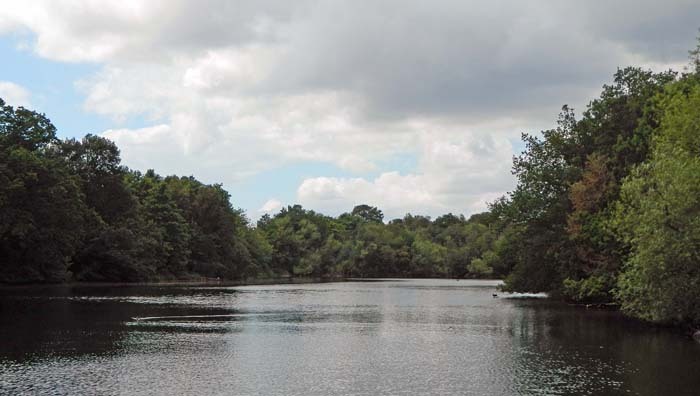 However, Richard Arnopp of the Friends of Wanstead Parklands considers that the islands were probably contemporary with the present Perch Pond, but were an afterthought to the original design and intended to mitigate an unforeseen aesthetic problem. In this scenario, the low water level in the Perch Pond as actually constructed left the dam separating it from the Heronry Pond much more exposed than would have been the case had the plan depicted by Rocque in 1735 been fully implemented, and the islands were designed to act as a screen when the pond was viewed from the east. Today the shapes of the islands have become somewhat distorted due to erosion and silting.